By many estimates, the world has recently crossed the point where more than half the global population is urban, a trend driven by rapid urbanization in developing countries. Urban centres offer economies of scale in terms of productive enterprise and public investment. Cities are social melting pots, centres of innovation, and drivers of social change. However, cities are also marked by social differentiation, poverty, conflict, and environmental degradation. These are all issues that not only matter to cities, but also lie at the heart of development. As such, the time is right to consider afresh the relationship between cities and development. 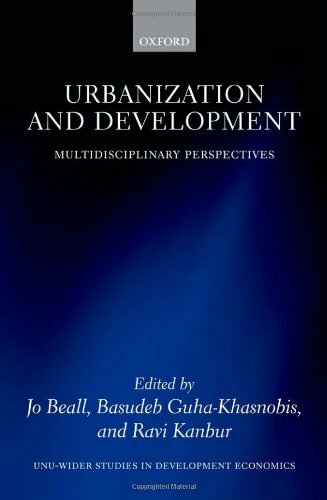 This volume presents a significant new collection of multidisciplinary papers focused on urbanization and its implications for development. It raises four questions: What is so special about the urban context? Why is urbanization and urban growth important to development at the present conjuncture? What are the strengths and limitations of our current state of knowledge about urbanization and development from the policy perspective? How can a multidisciplinary perspective on the urban context add value to development research and policy? Leading scholars in urban economics examine the data and definitions associated with the field, and look in-depth at the economic and social consequences of urbanization. Special focus is given to urban violence, and planning and governance issues, and the text is supplemented by case studies demonstrating the recent effects of urbanization in key countries such as India, Brazil, Tanzania, Lebanon, and South Africa.